James Beswick wants to make the fastest remote-control car on Earth. He's got his sights set on the standing record, set in October 2014, of 202.02 mph. And to beat it, he's created the 3D-printed Chaser. 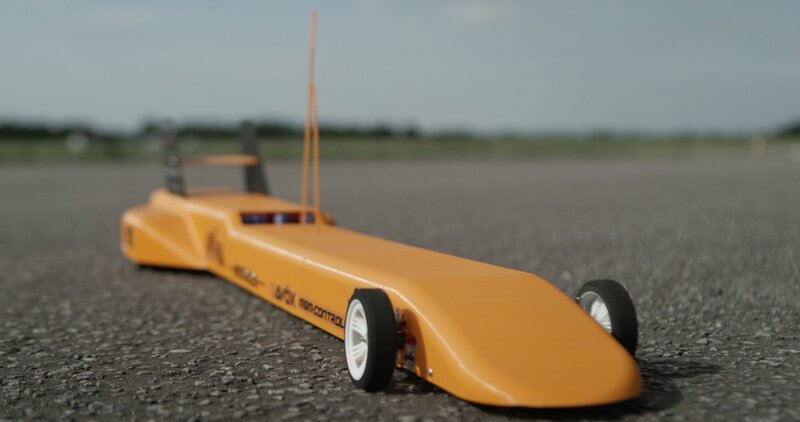 "The big challenge is that most remote control cars are only designed to go 40 to 50 miles per hour," Beswick said in a video produced by Ultimaker, the company that makes the printer he used to build the 4-foot-long racer. 3D printing allows Beswick, a UK resident, to make the car out of fewer pieces, creating fewer seams, thereby decreasing the amount of disturbance you get from the air (read: better aerodynamics). He can also make the body thicker than with standard parts, and put reinforcements where he needs them, to resist the bending and deforming of the plastic that takes place as cars go over 100 mph. "I don't know of anyone else who has thought to 3D print a body for a speed car," Beswick said. Beswick has gotten his Chaser up to just over 133 mph and will continue modifying until he breaks 202.